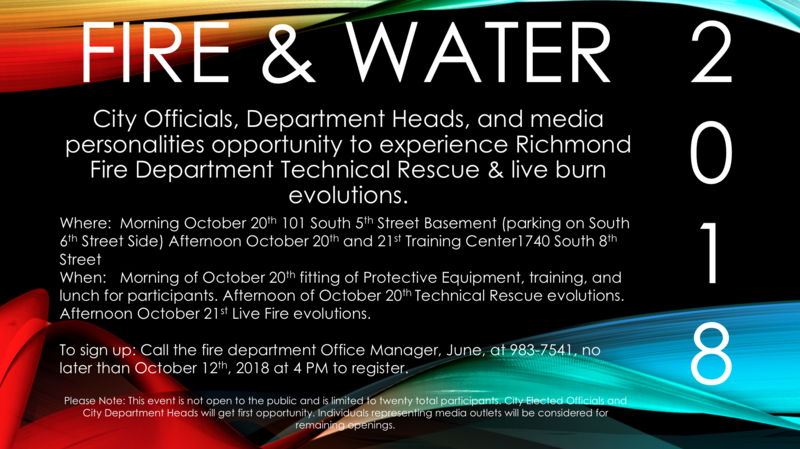 An oppurtunity for City Officials, Department Heads, and media personalities to experience the Richmond Fire Department! · Morning of October 20th at Fire Station 1, 101 South 5th Street in Basement (parking on South 6th Street Side). · Afternoon of October 20th & 21st at RFD Training Center, 1740 South 8th Street. · Morning of October 20th - Fitting of protective equipment, training, and lunch for participants. · Afternoon of October 20th - Technical Rescue evolutions. · Afternoon of October 21st - Live Fire evolutions. Call the fire department Office Manager, June, at 983-7541, no later than October 12th, 2018 at 4 PM to register. This event is not open to the public and is limited to twenty (20) total participants. City Elected Officials and CityDepartment Heads will get first opportunity. Individuals representing media outlets will be considered for remaining openings.